The school massacre in Newtown Connecticut was one week ago today. Horrific tales of terror, panic and death. And the agony that followed. But out of those stories have risen tales of heroism and bravery unequalled anywhere in history. The principal and school psychologist who lost their lives as they rushed toward danger when the first shots were heard. The teachers who hid children in closets and cupboards and bathrooms and then kept them absolutely quiet and safe as terror stalked past. And those who used their last shield, themselves, in a desperate and futile bid to save the lives of the little children in their care. And I weep for them and their sacrifice. It has gotten me thinking of the heroes in my life. The men and women who have appeared, sometimes fleetingly, and had a profound and lasting influence. My Mom, who taught me responsibility, caring for others and to always, always be kind. My Dad, who taught me the value of integrity, hard work and a sense of humour. My eldest brother who taught me generosity. My next older brother, who taught me the joy of friendship. My oldest sister, who showed me true patience. My youngest sister, who is a constant example of focused energy and unfettered joy. My youngest brother, who showed me that one must never quit. That by keeping on, great things are accomplished. Teachers who spent their entire lives . . . teaching. Neighbours who watched out for. People who appeared only briefly and taught me wonderful, important things. None of them have had to make the ultimate sacrifice in my behalf. None of them will ever appear in a newspaper or on TV as a description of their heroism is proclaimed aloud. But still they are heroes. So to those whose actions are so justifiably blazoned across news headlines and TV spots. And those whose contribution is not as noticeable or dramatic. I am offering a prayer of gratitude today. 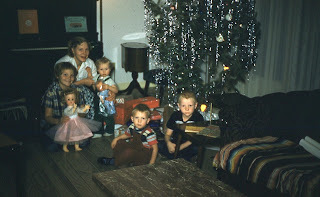 My first 'real' Christmas. Age 14 months. I've been trying to remember gifts I have received for Christmas. I know I received some. Stuffed toys and dolls. And the snuggling that ensued. Books. Nancy Drew in particular. Puzzles. Nearly always completed with my Dad. There was the one year that my parents gave me a small musical instrument. I think they called it a musette. It had a tiny black membrane that fit into one end and made the whole thing work. One could put a finger right through it. Don't ask me how I know this . . . 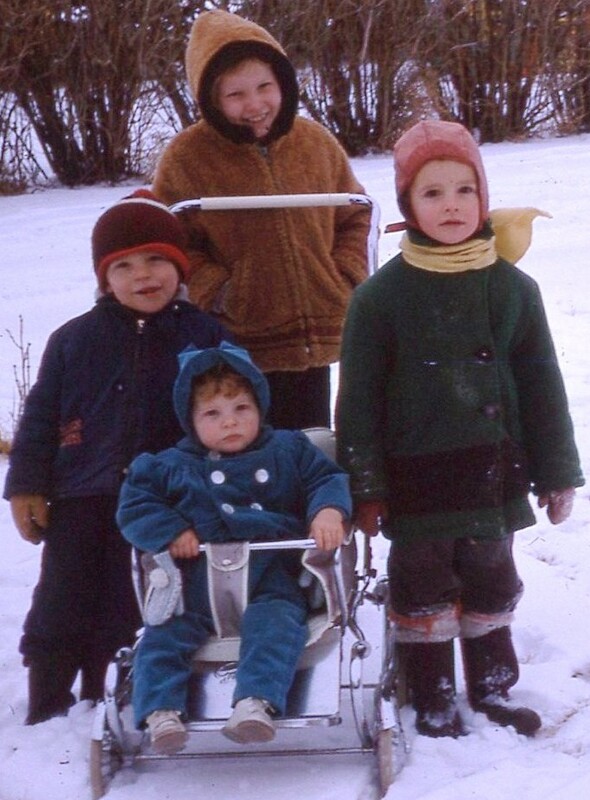 I clearly remember the year we all got skis. And the adventures that followed. And the time my brother gave me a camshaft. As it turned out, though, it wasn't my real present. He had wrapped it up to confuse me just in case I had caught a glimpse of what he had actually purchased for me. There were things I needed. And a mounted and stuffed Jack-a-lope head. Things I really, really wanted. And things that were just . . . sweet. And at least one bath robe. I've truly loved them all. They were given with love. And accepted with the same. 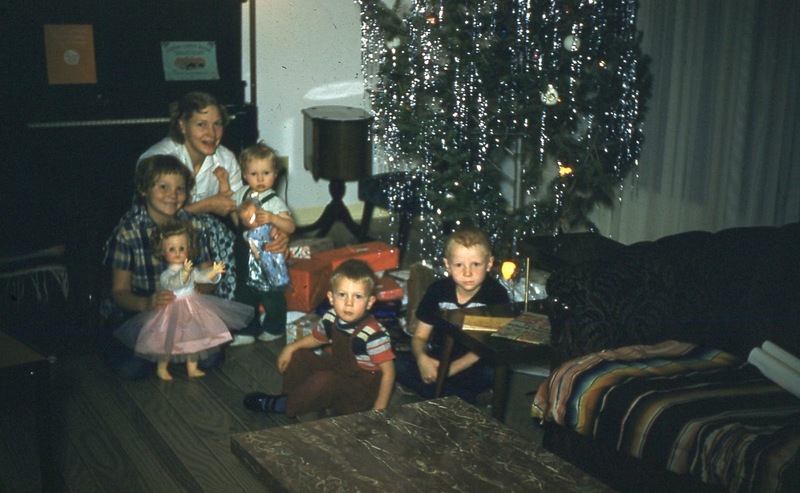 But I have been around for fifty seven Christmases, including this one. Why can't I remember fifty seven gifts? I know there was at least one per year. I guess it's because the memory of family and being together stands out more clearly. She and her girls would make a set of those. 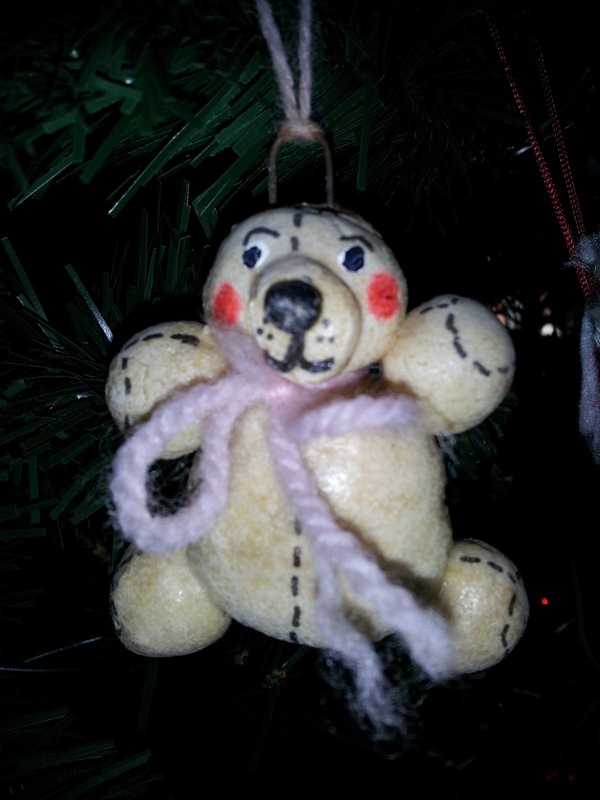 Still 'bear-ing' the scars of its trauma. The single mom, married with two more girls - most themselves married with children of their own. Best Holiday . . . Ever! It was the trip to end all trips. That magical place that only existed in my dreams. My Dad had come up with the plan, mostly because we had been everywhere else on the western half of the continent. We kids were . . . ummm . . . a bit enthusiastic. And we were going over Christmas, so none of that pesky waiting for Christmas morning. Instead, we took care of all of that days earlier. We handed over the reins of ranch management to a young couple, packed up the truck and camper (nothing but first class here!) and headed out. At first, singing and then talking about the wonderful and exciting experiences that were before us, sufficed to keep us entertained. Then book reading, desultory (real word) conversation and looking out the window. By the way, looking out the window was my Mom's favorite pastime on our car trips. Mom was decidedly predictable. Sort of like my car sickness. But that is another story . . .
Christmas day was . . . different. We couldn't find a Denny's. And no other restaurants were open. Dad finally found what could only be deemed a 'Greasy Spoon' or 'Dive' and we ate surprisingly good burgers and fries. Then we were again on the road. And Hurst Castle. Which I loved and where I would gladly have taken up residence. Except that the guards found me. Guards definitely don't have a sense of humor. Dad managed to find a parking spot at the outer rim of the lot, quite near Canada, actually and we trudged with purpose towards . . . the Great Gates. The doorway to magic land. The entrance to dream world. At that point in time, one did not buy a 'pass'. That would have been . . . convenient. Instead, we all got coupon books. There was a section of 'first run' attractions. A section with 'lesser', but almost as popular. And several sections after that. The 'Haunted Mansion' had just opened. Does that date me a bit? The only problem was that this was the first sunny day in Los Angeles for several weeks. And the entire population of the planet had suddenly decided that Disneyland was the place to be. We had to share our magical world with 70,000 other people. The line-ups were so long that choosing which ride to go on was not a matter of which was the most exciting, but which was the most available. My brother and I stood for 3 hours to see the Haunted Mansion. The entire afternoon. Oh, it was definitely worth it, even though George refused to go in the same car with me and I had to be frightened out of my wits all by myself. For some reason, he had a problem with me wrapping my arms around his neck and screaming into his ear. After that, things are rather a blur. I remember seeing Lincoln giving an address. The real Lincoln. Somehow, Disney had convinced him to come out of retirement (ie: death) and perform for us. We went on a few 'ride' rides that didn't have enormous lineups. And, at sundown, went for a romantic ride on the Mark Twain riverboat. Yes, I'm sure the sign said 'romantic'. I was, again, with George. Who told me to stay on my side of the boat. Okay, so, what did he think I was going to do? Cuddle up to him and coo in his ear like all of the other people were doing? I remember eating a lot. But then, I always remember the food. And I remember thinking it was the best day of my life. 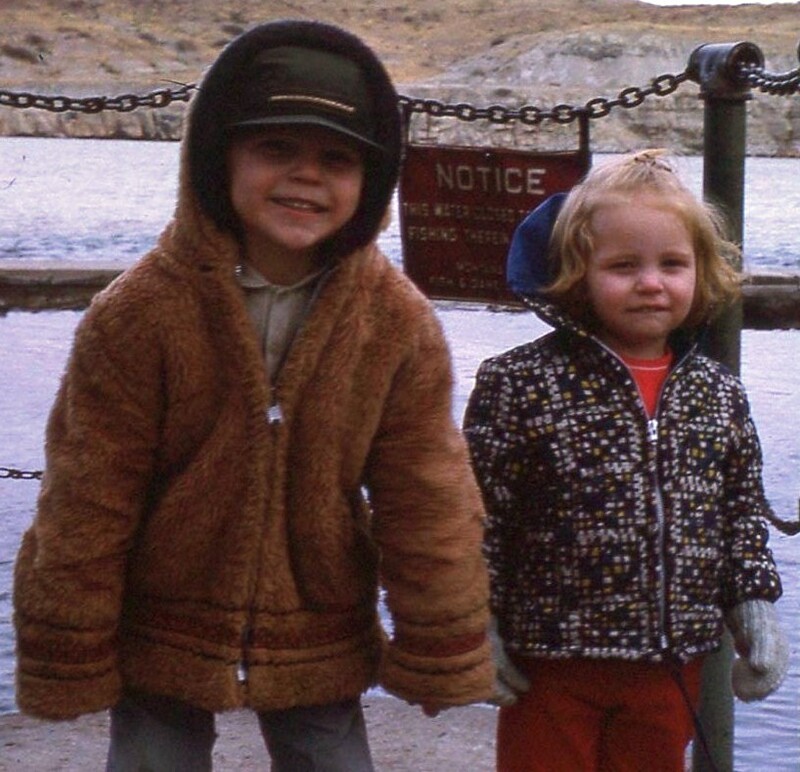 We only had one day there, but there were no complaints because Dad then took us to San Francisco and we got to ride the trolley car and tramp around Alcatraz Island. And I got a shirt that said 'Property of Alcatraz - Unlisted Number' which I thought was hilarious. And then, home. Which was an adventure all by itself. We hit high winds near Pocatello, Idaho that nearly tipped us over, so Dad and the rest of the family parked in a campground with the truck's nose facing into the wind to keep it from performing gymnastics. And he put George and I on the bus home. Apparently, the couple looking after the ranch had to leave. All I knew was that I got to ride on a Greyhound. Okay, it was with my brother, but why haggle over details? It was the perfect end to a perfect trip. This summer, we were camping with our good friends and the topic of Disneyland came up. I described my own experience. They stared at me in disbelief. "You mean you only got to go to one major attraction?!" I described the circumstances again. More incredulity (another real word). "You drove all that way and hardly got to do anything?!" And for the first time, I thought about that. Huh. We had only gone on one main ride. We had wandered round the place and seen a lot of other people going on other rides. We had eaten treats and watched exciting things. And it had been a very long drive. Nope, it was still worth it. Labels: Disneyland. Not for the faint of heart. Ella Davies hates Christmas and everything about it. There was a time when Ella loved Christmas. Until one horrifying night that would change a young girl's life forever. Work and solitude offer her comfort now. Work and solitude and a simple system of never caring too much. But an encounter with a young grocery clerk on Christmas eve starts Ella on a journey that will take her into the vastly different lives of several very special people. And give her the opportunity to be the angel that these people so desperately need. And one of those needy people just might be her. It is a tale of discovery, courage, compassion and love. Beautifully, tenderly told, it touches the heart just the way a Christmas story should. And clearly illustrates that the best way to find our own heart is to give it to someone else. Ella Davies hates Christmas. Every year she spends the holidays working, trying to forget the pain of a childhood tragedy that left her all alone. But this season, Ella’s about to learn something only an angel could teach her. This modern twist on a Christmas classic will remind you that the best gifts of all are the loved ones you learn to treasure! Janet Halling discovered her love of writing at the age of six when her story of a lonely duck won a first grade writing contest. She has a BA in Marketing Communications and lives with her husband and four children in northern Utah. She is currently working on her next novel. Still away . . . having a great time!!! Anita, Blair, and Me - in my little gold beauty. 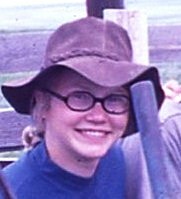 It wasn't often that we kids were able to go on a field trip with my Dad. When it happened, we were eager. When it happened at Christmas, we were beyond excited. That's all of the 'E' words I can think of. Except that 'energetic' should be stuck in there somewhere. And, for me, usually immediately followed by, "Empty all tanks!" When I think about it, I guess it's not surprising that we didn't go on field trips with my Dad very often. Dad was taking us four oldest kids to the Sweetgrass Hills to cut down our family's Christmas tree. Families did things like that back then. But we had to make a quick stop in Milk River at the Robinson's store to get me a winter coat. I had outgrown my old one and Dad wasn't excited about trailing me through the forest wrapped in my blanket. So the excitement level for this trip had just been dialed way up. In fact, I was so elated, that Dad didn't even wait for the 'announcement' (see above), but sat me in the car with a bucket already in my lap. I should explain here that the Robinson's Store was the only shop in Milk River that featured clothing. There were neat piles of everything wearable. And the wood plank floors creaked delightfully. And if you were really lucky, you got to watch Theo Barrows gift wrap packages at her counter in the middle of the store. The curling of the ribbons was especially fascinating. Where was I . . .? Dad asked the manager where we could find coats in my size and was conducted, with me tagging eagerly behind, to a rack at one side of the store. My eyes were immediately drawn to a gold, furry, wonderful garment. I reached out a hand and brushed the soft fur. "This one, Daddy! This one!" "Okay, we'll try this one," Dad said. I dropped my blanket and slipped my arms into the sleeves. "I guess we'll take it," Dad said. 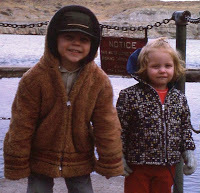 Good thing, too, because there was no way they were ever going to pry me out of that coat. Dad paid and we trooped back out to the car. The other kids excited now to get to the real reason for this trip. Me brushing and brushing the soft fur on my arms and chest. We had fun finding the tree. We did end up with one. I really don't remember much about it. Me and my coat were happy, sitting in the car together. And watching through the windshield. Because, after all - one couldn't wear one's new coat out into nature! What if it got soiled? Dad later said something about 'waste of time and money'.